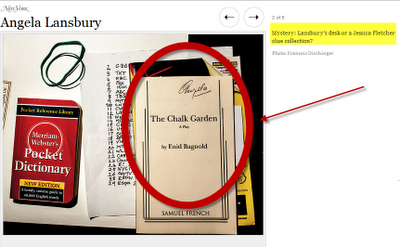 Adventures in the Endless Pursuit of Entertainment: Angela Lansbury: THE CHALK GARDEN!!!!! Angela Lansbury: THE CHALK GARDEN!!!!! I've been waiting to find out if the clue in the photo of Angela Lansbury's desk in the New York Magazine Shoot that appeared last May was anything. Finally, she reveals to the Sydney Morning Herald that, "...already anticipating a role in New York this time next year in the Enid Bagnold play The Chalk Garden."